Advent has just begun which is always the last indicator that Christmas is just around the corner - as if we didn't need another reminder. Advent is an important point on the German Christmas calendar and I've embraced it as a symbol of the season. Over the last couple of years, I've allowed Advent to inspire my challenges for you and so I decided that this year should be no exception. In the past I spent a lot of money on gorgeous Advent wreaths but trying to save some money last year, I decided to have a go at making my own Advent candle display. It cost a fraction of the cost of my over the top but wonderfully gorgeous Advent wreath, and I loved it. I focused on metallics and specifically, copper which is not only a trend colour right now but also a colour I've been bringing into my home decor. I hope to find a way to do this again this year. So, with that in mind, I'd like you to be inspired by this colour scheme of copper, pinks and burnt orange. 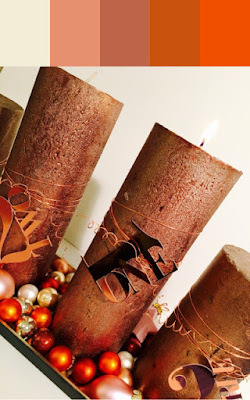 Of course, you might take your project in another direction and concentrate on Advent itself, a weekly activity, a count down/up to something, the shape of the candles and mini baubles, or maybe just the candles themselves. The colour sample I was able to make from my photo doesn't show the metallics of course, but I know that this is where I'll be going with my project - I have them all in my stash right now! How many different metallics do you have? You can either upload your layout into the Whimsical Musings Flickr gallery with the tag WM#239 or you can post it in our Whimsical Musings Facebook group. We've decided that we'll save albums for special occasions so just load up your photo to the group with the tag WM#239 in the write up text so that we can find it. Oooooo, pretty! Works perfectly for something I need to work on.